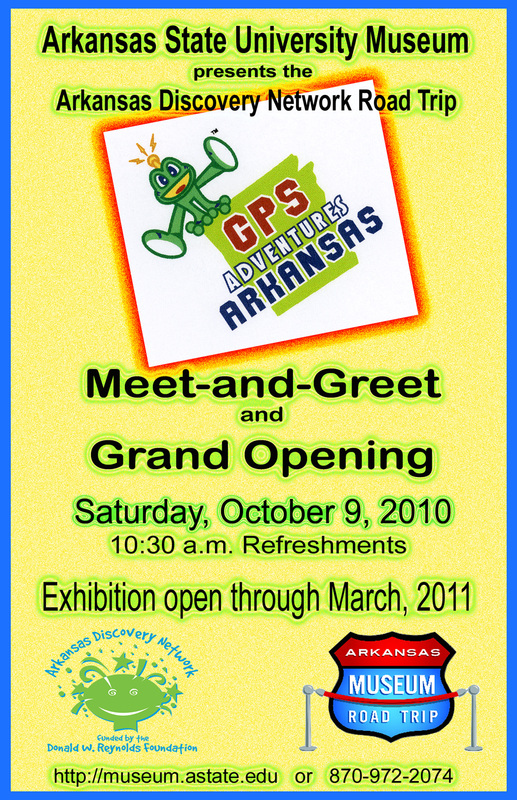 October 4, 2010 -- A special grand opening and meet-and-greet will kick off the "GPS Adventures Arkansas” exhibition opening Saturday, Oct. 9, at the Arkansas State University Museum. The exhibition is free to the public, and refreshments will be served at 10:30 a.m.
“GPS Adventures Arkansas” highlights the history and current uses of GPS (global positioning system) technology. Geared toward ages six through adult, this exhibit highlights the popular sport of geocaching, a worldwide game of hiding and seeking treasure. Visitors can learn the basics of traditional and modern navigation and about the sport of geocaching. Visitors will hunt for Rocky, the ASU Museum’s geocache, and help get Mona the Mastodon back to the Bering Straits. There are also hands-on exhibits to play with and a maze to wander through. Geocaching is a high-tech treasure hunting game played throughout the world by adventure seekers equipped with GPS devices. The basic idea is to locate hidden containers, called geocaches, outdoors and then share the experiences online. Geocaching is enjoyed by people from all age groups, but one thing geocaching fans have in common is a strong sense of community and support for the environment. There are over one million active geocaches around the world. The information hub for the sport is www.geocaching.com. "GPS Adventures Arkansas," part of the Arkansas Museum Road Trip collection, was developed by Groundspeak and Minotaur Mazes with development support from the National Executive Committee of Space-Based Positioning Navigation and Timing and technological contributions from Magellan and Spatial Solutions, in cooperation with the Arkansas Museum of Natural Resources and the Arkansas Discovery Network, funded by the Donald W. Reynolds Foundation. The Arkansas Discovery Network, funded by the Donald W. Reynolds Foundation, works to strengthen partner museums by sharing resources and expanding discovery learning opportunities throughout the state. Member museums include the Museum of Discovery in Little Rock, Mid-America Science Museum in Hot Springs, Arts and Science Center for Southeast Arkansas in Pine Bluff, Texarkana Museum System in Texarkana, Arkansas Museum of Natural Resources in Smackover, Arkansas State University Museum in Jonesboro and the University of Arkansas Center for Mathematics and Science Education in Fayetteville. Visit the website at www.arkansasdiscoverynetwork.org. The Donald W. Reynolds Foundation, headquartered in Las Vegas, is a national philanthropic organization founded in 1954 by the late media entrepreneur for whom it is named. The Foundation is one of the 50 largest private foundations in the United States. Schools and other organizations interested in group reservations to visit GPS Adventures Arkansas should call Jill Kary at (870) 972-2074 for more information. School tours and general admission to ASU Museum are free. Regular hours are Tuesday, 9 a.m-7 p.m.; Wednesday-Saturday, 9 a.m.-5 p.m.; Sunday, 1–5 p.m. The museum is closed on Mondays and university holidays. For details, contact Dr. Lenore Shoults, ext. 2074.